Although there is really not all that much of an actual story presented by author Arthur Dorros in his Papá and Me, the book is still a truly wonderful slice of life so to speak, a glowing exultation of a young bilingual boy spending an entire day with his unilingual Spanish speaking father (and I do truly both love and appreciate how textually, the author has incorporated so many Spanish expressions, nouns, verbs etc. and in such a way that one does not even in any manner require a glossary, as they can all pretty well and easily be figured out simply from the context of the narrative and that, in fact, for many of them, an English language translation is provided, both naturally and beautifully). Now while I on a personal and aesthetic level do not actually find Rudy Gutierrez' accompanying illustrations as entirely to my tastes (for while I love the depicted facial expressions of the little boy and his Papá, his Daddy, and absolutely adore the glowingly wondrous colour schemes, the depictions of both arms and feet are often rather too strangely unnatural and overly rounded for and to me), I still do in fact strongly believe that they provide a descriptive and fun mirror of Arthur Dorros' text, and thus, a high four star ranking for Papá and Me and very much recommended (as long as readers do take into account that Papa and Me is definitely not a plot driven story by any stretch of the imagination, but simply a lovely little interlude, an evocative and delightful description of a boy and his father enjoying the fun and sweetness of spending the day together). Oh and by the way, I would also very glowingly, warmly and strongly recommend Papá and Me as a useful and engaging adjunct tool for basic Spanish language learning and teaching, as many, as actually most of the Spanish expressions and words featured are commonly used vocabulary choices, and it sure is more fun to both teach these and learn these in context (even by means of a simple and colourful picture book) than to tediously have to memorise vocabulary lists. A young boy and his papa may speak both Spanish and English, but the most impartant language they speak is the language of love. Here, Arthur Dorros portrays the close bond between father and son, with lush paintings by Rudy Gutierrez.QuoteWe are always cooking up something new. He wants eggs. I say pancakes! Papa brings down a plate. He flips, I catch. We invent a special food. "Sabroso!" papa says it is so tasty. This story is about a boy and his Papá spending the day together. The boy wakes up his Papá so they can have a great day together. They sing together in harmony. They cook together while helping each other through the process. They leave for their fun day together. They assist each other along the way. The boy holds his father’s hand while they cross the street as he is told. They play in puddles at the park. The boy’s father helps him climb a tree; but still tells the boy to be careful. They then draw together in the sand before they have to leave the park. As they ride the bus home they tell each other stories. The boy learns that they both have strengths and weaknesses. This story contains some Spanish words, which are also repeated in English. This book has a reading level that students in kindergarten or up to third grade can read. Reading this book during father’s day is ideal. Though it can also help teach students to follow the rules, listen to adults, and be a good helper. Boys, especially boys that have fathers that they are close with will most likely enjoy this book more than other students. While in a group setting, students can think of ways they can help the adults around them. They can come up with tasks that they can do better that an adult, and vice versa. The entire class can share examples of them helping, and or listening to adults correctly. The class can also take turns analyzing the characters and their strengths and weaknesses. Sylvester and the Magic Pebble by William Steig is a related book that teaches children to be grateful for family. Papá and Me does not have any multimedia connections. Plot Summary: This bilingual book is a fabulous representation of a father and a son’s love for each other. This book really has no specific plot, but rather focuses on fun and exciting events the boys come across on the way to Abuelo & Abuela’s house. The special bond that the boy and his father have is depicted by events such as holding hands, playing at the park, playing in puddles, and having races. Since this is a bilingual book, it represents the Spanish culture and includes Spanish language throughout. This is a wonderful book for all ages to highlight the importance of family and also welcomes diverse groups of readers to enjoy. Literary Merit: I believe the illustrations in this book should be given the credit they deserve and really add value to the book. The vibrant colors chosen by Rudy Gutierrez have a way of bringing the story to life and having the reader feel the emotions being depicted. Some pages are full of bright colors and shapes that may come off as a little chaotic, but the Latino culture is known for using these types of illustrations. The illustrations are also so full of movement that they almost ‘dance’ across the page while encouraging the reader to continue reading. The whole book is infused with warm colors such as reds, yellows, and oranges to express the loving and warm relationship between the father and son as well. Classroom Connection: For a classroom connection, I would use this bilingual book as an opportunity to extend my students knowledge of the Spanish language. First, I would have them identify all the Spanish words in the book in list form with the English meanings as well. Then I would assign each student a word to make a ‘flashcard’ using colorful crayons. By the end of the class, we would have a deck of Spanish flashcards for the class to use at any time to practice Spanish. I would also take the opportunity to practice the flashcards as a whole group each day to help with recall. Another activity we could incorporate was sharing what we call our parents and grandparents. In my future classrooms, this book would be excellent to use in a text set about families and their culture. Students can also write about the special times and events that they do with their families or a member of their family. Plot Summary:-The picture book "Papa and Me" is written by Arthur Dorros. The story is about a Papa and a son who speak both English and Spanish. It tells of their loving relationship and the things they do on a daily basis. The picture book describes the love Papa has for his son, and how they travel through their city each day doing certain things loving each other and also playing. Literary Merit:-In this picture book I believe the illustrations are the most important literary element to the story. The medium of paint chosen by illustrator Rudy Gutierrez is a great choice of medium for this story. Each page has a range of different colors to show the mood of excitement, happiness, or love between the Papa and son. The illustrations in this story are great paintings of the adventures of the Papa and son in this story using bright, vivid colors. Without these quality illustrations this picture book would not be as great as it is.Reader Response/Classroom Connection:-In order to connect this picture book to my classroom I would hold a show and tell for my students. I would have each child bring in their Papa's to our classroom and talk and show things that they do with their Papa. If a student did not have a Papa in their life they could bring a mother, grandpa, or grandmother or someone else very special to them. This would give the children a chance to get excited about the close relationships in their life and tell the class. After the show and tell I would ask children to write a short paragraph about their Papa and themselves. Genre: Children's Literacy; InformationalSummary: A little boy and his father use both Spanish and English to depict their special relationship together.A: From the very first pages of the title the reader can imply that there is a special connection between the little boy and his father. Perhaps, it is through the activities they do together or the languages they share, but it is clear there is much love and admiration on both parts.B: The endpapers of this book allow the reader to gain understanding of the concept of this book; for it was written by an author who has a son and speaks both Spanish and English with him. With that being said the reader is able to emotionally connect with this story and knows their was love written into every scene. On top of that it can be seen how the intermingling of languages helps to strengthen the bond of father and son because it is like they have a language all their own.C: When the little boy explains their morning activities he makes it seem much more intimate and extraordinary than a normal morning. The boy wants eggs while the father wants pancakes, but instead the father makes something "extraordinary". Then papa describes their meal as sabrosa!, which meant it was great tasting. Curriculum Connection: This book would be an extraordinary tool to use with ESL and ELL students whom are Spanish speakers. It is a story they could feel confident with understanding its meaning. A simple book with beautiful illustrations. This book focuses on the love and bond between a father and his son. The book is written in English with a few Spanish words thrown in (the Spanish words are all defined within the text). This book is perfect for teaching diversity and introducing a different language in the classroom. There's not much of a story here, but the illustrations are beautiful and colorful. I've never seen any other illustrations quite like them. This book was a 2009 Pura Belpre Award honor book for illustrations, and rightly so. I like this book for its uniqueness in that it uses Spanish and english words and phrases. This is cool for young kids to see and learn, and show them that different cultures can sometimes do similar things. The loving relationship between boy and his father is fun and entertaining. Uses Spanish words sprinkled throughout, always translated immediately, but gracefully.The story of a father and his son on a day out. They enjoy spending time together. Swooping illustrations show lots of movement and action. "Papa and Me" by Arthur Dorros is a great book that shows a relationship between a father and son. The book goes through showing and telling the story of what the father and son do throughout their day from morning to night. It does a great job of including Spanish words and stating the translation right after to help students understand. Throughout the story, as the son and father are enjoying their day at the park and the bus ride home they talk in Spanish to help still speak their language. Papa and Me is a great bilingual picture book about a full day with a boy and his father. What i liked best about the book is that you read the word in Spanish but shortly after that word is read, you read it again in English. This book is great for teaching students Spanish. The father only speaks Spanish to his son, and the son only speaks English to his father, the reader may think well how can they communicate if they are speaking in two different languages. That is the beauty of this book, because the language that is understood is love. Love is shown throughout the book with its words and pictures. Whether the father and son are making breakfast in the morning or going to their trip to the park, love is still there. It is very evident that the boy looks up to his father, in every picture father is seen overshadowing the boy and the boys must look up to his father, not only because he is taller than him but he looks up with admiration. The story ends with a bus ride to the grandparents house where stories are being told, and when they arrive at the grandparents house, they are greeted with a huge hug. This is a story about love, compassion, and family. The pictures covers both pages and is spread with color and nonstop movement. The pictures flow with the words and cultural of the book, Spanish folk-art. With powerful illustrations like these who needs words; the pictures stand for themselves. They make the book come to life. I really enjoyed this book. 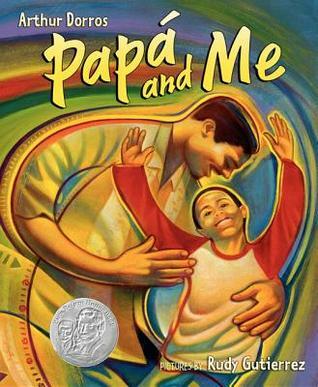 Title: Papa and MeAuthor/Illustrator: Arthur Dorros/Rudy GutierrezISBN: 9780060581589Date of Publication: April 22, 2014Review: This was a wonderful multicultural book about a young boy and the things that he does with his father. The book is written primarily in English with Spanish phrases riddled throughout. The book depicts a positive relationship between a boy and his father, which is something that a lot of the young boys of today don't have at home. The boy's mother is never mentioned in the book. I loved this book because it incorporates all of those elements into a great storyline. The relationship between the boy and his father is a good example for boys who have not had those experiences with their own father at home, and could open up meaningful communication opportunities between the teacher/adult and that child to talk through the issue. The illustrations in this book are unconventional, but beautiful and colorful, much like Hispanic culture itself. This was a great book and a great read aloud for children of all ages! A young boy spends a fun, interactive day with his Papá as they travel to the beach, play in the park, draw in the sand, and visit los abuelos. A Pura Belpré Honor Book with beautiful, almost surreal illustrations by Rudy Gutierrez, Papá and Me not only includes Spanish language phrases and words throughout the narrative and dialogue, but also provides a moving story about the relationship between a son and his father as they share both universal and distinctly cultural experiences together. The inclusion of extended family with the presence of grandparents also highlights the importance of family within the Latino culture, and is also an experience relatable to many readers. Mixed race characters in the illustrations also reflect the diversity found within the Latino community. The fluid motion of the illustrations supports the continuity of the narration as it takes readers throughout this very special father/son day. I loved loved loved the illustrations in this book and I loved the relationship between father and son. I liked the back and forth between the two, the Spanish that his father spoke and the boy's understanding of it. There were a couple of times that the explanation of the Spanish felt like a translation instead of part of the boy's voice/thoughts, which brought made it less than 100% perfect for me, but I still felt like this is one of the best books representing language in intergenerational U.S. [email protected] families that I've gotten my hands on. It is also true, as a couple of people have noted, that there isn't exactly a narrative to this book, but I don't think that's a problem since there are a ton of children's books that aren't stories, just showing things and sharing experiences. That said, I did think it COULD have had a little more narrative to it and held together even a little more. In the end, I think this was more 4.5 than 4, but I am being stingy with my stars today. 'Papá and Me' chronicles a day in the life of a young boy and his father as they attend to various errands around the city, creating their own adventures until finally drawing the day to an close at the house of the boy's Abuela and Abuelo. The majority of the text is in English but the boy uses various actions or simple translation to restate the Spanish dialogue of his Papá. Every activity that the pair engages in is depicted as a brilliant, swirling, curving event, with illustrations that are reminiscent of traditional Latino art forms. They climb trees together, share stories on the bus, and draw in the sand - all the while smiling and embracing each other. This story validates single-parenting and those experiences of bilingual children who serve as cultural brokers between their parents and the outside world. In this story, a family's love is in no way limited by its small size in comparison to more 'traditional' nuclear forms and larger families. Papa and Me" shows the close relationship between a father and a son. I think that this is important to address because we often find sing parent homes where the mother is the single parent. In my Kindergarten placement this year, there is a child who is from a single parent home in which the father is the only parent. Books like this may help students that are in those same predicaments to feel welcome and help them to understand that it is ok to have a single parent father. The story follows child and his father through their day from waking up and making pancakes together, to drawing pictures in the sand, to racing home. The book is mainly written in English but is also beneficial to Hispanic children as it offers many Spanish words throughout the book. Papa and Me is a story about the adventures of a father and son on a fun day together. The make breakfast together, sing, climb trees, draw in the sand, and more. The father speaks Spanish, and then the son replies to him in English. This story does not have a problem/resolution, rather it just follows the activities of the two throughout the day. This book would be good for teaching beginning Spanish because any time Spanish is used, it is almost immediately translated by the boy. For example, when they are crossing the street, "Papa says, 'La mano' and he takes my hand." The painted illustrations are very interesting- everything is rounded/circular. This story shows that even when your family may have differences in language, the language of love is always stronger. beautiful, uplifting book about a young boy's day with his father. lovely relationship between the two. wonderful integration of Spanish into the story - very seamless. The boy speaks in English and Spanish, the father answers in Spanish. But the narration clearly explains, without seaming forced. The illustrations are vibrant and show the action in a young boy's life, and the love these two have for each other. perfect for preschool or young elementary. A Pura Belpre Honor Book 2008. "'Good morning!' I call to Papa. 'Buenos dias,' Papa says back to me.He pushes sleep from his eyes.I am awake and ready to go.It will be a great day for Papa and me. 'Cantemos, cantemos.' We sing.I sing high, he sings low,our different voicesgo together." 'Papa and Me' by Arthur Dorros is a story about a little boy's special day with his father. They sing, make breakfast, walk, and visit a park. The son climbs a tree and sees shapes in the clouds. They draw in the sand, ride a bus, tell each other stories, and race. This is a sweet story that highlights the father-son relationship in a positive way. Two things work to make this children's book more than a simple story. The first is the colorful, imaginative illustrations by Rudy Gutierrez. They are so full of movement and rhythm they seem to dance across the page. The second is the text of the story that weaves Spanish vocabulary and its English translation seamlessly into the story. This short narrative is both lighthearted and educational, a must read. Brightly illustrated, this title follows a young boy and his father as they enjoy a day together. Speaking in Spanish and English, the two have breakfast, go to the park, play together, and race each other to Abuela and Abuelo's.Arthur Dorros skillfully weaves together the dialog, making it clear to non-Spanish speakers what is intended by the Spanish words and phrases. Illustrator Rudy Gutierrez combines fairly realistic faces with surrealistic backgrounds that seem to echo certain bright Mexican murals.The love and delight father and son have as they spend time together is clear on ever page. This title could be used in programs on fathers, sons, and even "Saturdays." Beautiful illustrations, a lot of wonderful intimate moments between father and son, and hugs from the grandparents! Plus, Spanish words are intermingled with the story, repeated in English for those who don't know Spanish. I do like the bonding between father and son; however, when you juxtapose this book with Mama and Me, you can see that the boy does all the active things and the girl does the writing and painting and clothes. So the gender dichotomy could use some work, but it's a start because there are no judgments here. A boy and his father spend the day together, singing, and cooking breakfast, and walking to the park. Speaking in English peppered with Spanish words and phrases, they move throughout their day, celebrating being together and having fun.I love the joyful feeling of this book, and the love that seeps through the pages. The Spanish phrases add an interesting element to the story, and are shown well enough so readers who don't speak the language shouldn't feel left out. The father is a wonderful role model, and the lively illustrations are colorful and warm and filled with the love between a father and his son. Arthur Dorros - Rudy Gutierrez - Rayo - 2008 Ages 8-10. Papa' and Me is a real, simple easy to read very well illustrated book. This book takes us through a boy's journey with his father and what they are both good at as well as what they would like to work on. This book doesn't have a lot of words so there isn't much to really tell about it, but I wasn't a big fan of it. I think that the illustrations were very well done, but it wasn't my favorite book and I couldn't really relate to it like some of the previous books. The only thing that I could relate to was the fact that I am trying to get to know my dad and hang out with him more as well to see what our strengths are. Pura Belpre Illustrator Honor for Rudy Gutierrez Colorful words and images on the endpapers introduce the theme of love between a father and son, who don't always speak the same language. The illustrations swirl with movement as they depict a young boy and his beloved Papa enjoying a day together. Outlined by dots, lines and images of birds, fish and other animals, the paintings suggest symbols of traditional Latino art. In accordance with the Pura Belpre Illustrator Award criteria, Rudy Gutierrez's paintings affirm the unique Latino cultural identity of the characters within this universal family story. This was an interesting but good book. It was a fun read. It would definitely be fun for students when they hear both English and Spanish spoken in the book. It has amazing pictures and the colors are beautiful. Over all it is a really good book. I feel that the children will love this book. In my classroom I would use this book in a lesson when I teach about different cultures and languages. It would be fun to have someone who can speak Spanish come in and translate what it says in Spanish. And even read the book in Spanish. I feel that the children would love to have it read to them in a different language. Overall this is a very fun, educational book. This is a beautiful bilingual book. It is about the every day adventures that the little boy and his father have. They both speak Spanish and English. Throughout the book it shows how close the little boy and his father are to one another and how they love spending time together. This is a great book for when wanting to introduce a different culture and Spanish words to children. Not only do the children learn from this book, they will be entertained and enjoy it as well. The illustrations are full of colors and emotion. Had so much fun reading this with my K-2nd graders as part of Hispanic Heritage Month. Students loved the beautiful story about a boy spending a carefree day with his Dad. Introduces many Spanish words. I enjoyed seeing my Spanish speaking students raising their hands showing us how to pronounce the words. I put other spanish/english books out on display for students to check out. A highlight was seeing Spanish speaking student going through one of these books with her friend and telling her how to say the words during their free choice time. A bilingual book that tells a story of a Hispanic boy and his dad, having a fun-filled day. A good way to bring diversity in the classroom, as it shows a different lifestyle and relationship, and includes Spanish vocabulary. The illustrations are super unique, but I personally did not like the very warm toned warped paintings of the father and son.